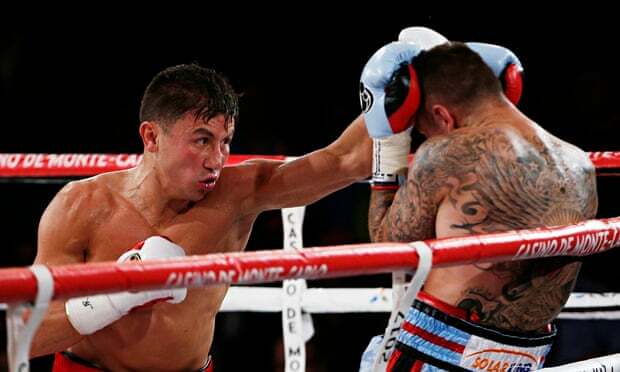 Gennady Golovkin on Saturday retained his middleweight championship when he stopped tough Martin Murray in the 11th round in the main event from Monaco, Monte Carlo. Golovkin (32-0, 29 KOs) has now stopped his past 19 opponents inside the distance. He did so while decking Murray three times. Referee Luis Pabon finally stopped the bout in the 11th. Golovkin, of Kazakhstan, is trained by West Covina native Abel Sanchez at Sanchez’s Summit Boxing Gym in Big Bear. Murray, of England, is 29-2-1. Finally, after multiple failed attempts beginning as far back as late 2009, Floyd Mayweather Jr. and Manny Pacquiao will get it on May 2 in a welterweight title-unification bout at MGM Grand in Las Vegas. Since Mayweather fights for Showtime and Pacquiao for HBO, both cable networks will make the fight available on their respective pay-per-view arms. Mayweather on Friday afternoon displayed a photo of the signed contract on the social network Shots. “I am glad my decision to meet with Manny and discuss making this fight happen helped get the deal done,” Mayweather said. Mayweather and Pacquiao ran into each other at an NBA game between the Milwaukee Bucks and Miami Heat in Miami on Jan. 27. They met later that night in a hotel room to talk about the negotiations. “Giving the fans what they want to see is my main focus,” said Mayweather, who is 47-0 with 26 knockouts and the consensus No. 1 pound-for-pound fighter in the world. “This will be the biggest event in the history of the sport. Boxing fans and sports fans around the world will witness greatness on May 2. This bout is a virtual cinch to break pay-per-view and live gate records. The highest number of pay-per-view buys is 2.4 million for Mayweather-Oscar De La Hoya in 2007. Previous negotiations went awry for a number of reasons, from Pacquiao not agreeing with the type of drug-testing Mayweather wanted he and Pacquiao to undergo, to Mayweather wanting too big a piece of the pie. Mayweather will reportedly receive 60 percent of the monetary split for the bout. “I am very happy that Floyd Mayweather and I can give the fans the fight they have wanted for so many years,” said Pacquiao, who is 57-5-2 with 38 knockouts. “They have waited long enough and they deserve it. It is an honor to be part of this historic event. While Mayweather has never lost, Pacquiao has lost twice since this fight was first talked about more than five years ago. He lost a disputed split-decision to Timothy Bradley in June 2012 at MGM Grand. Then, six months later, he was crushed and knocked cold by Juan Manuel Marquez that December at MGM Grand. Pacquiao fell face first after eating a perfectly timed right cross from Marquez. No problem, said Pacquiao’s trainer, Freddie Roach. Bob Arum promotes Pacquiao. He, too, believes his fighter will come out on the winning end in this sure-to-be epic battle. The only down side to this is the ages of the fighters. Experts and fans alike no doubt would have loved to see these guys tangle five years ago. As it stands today, Mayweather will be 38 on Tuesday and Pacquiao is 36. A week ago Friday it was the junior middleweight division that took center stage in the Boxcino tournament staged by longtime promoter Artie Pelullo and his Banner Promotions. Tonight (Friday) at 6 on ESPN2, it’s the heavyweights and there are two area boxers involved – Razvan Cojanu and Andrey Fedosov. Cojanu, of Burbank via Romania, is 12-1 with seven knockouts. He’ll take on Ed “Tex” Fountain (10-0, 4 KOs) of Ferguson, Mo., in a quarterfinals bout. Fedosov, of Hollywood via Russia, is 25-3 with 20 knockouts. He’ll square off against Nate “Heaven Sent” Heavern (9-1, 7 KOs) of Ocala, Fla. The bouts will take place at Turning Stone Resort & Casino in Verona, N.Y. The winners will advance to the semifinals in April. All tournament bouts will be televised by ESPN2, with the champions being crowned with regional titles. They’ll also earn top-10 rankings in two of the four major governing bodies. 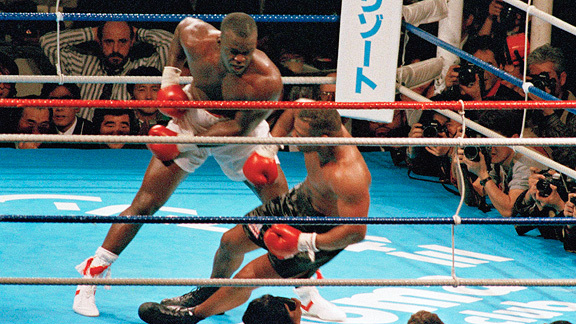 Twenty-five years ago today – Feb. 10, 1990 (Feb. 11 in Japan) – James “Buster” Douglas knocked out heavyweight champion Mike Tyson in the 10th round in Tokyo, Japan to shock the world in perhaps the biggest upset in history in a big fight. Douglas survived an eighth-round knockdown to come back and sock it to Tyson in a way that will always be remembered. If you want to see it again, or see it for the first time, tune in to ESPN2 tonight (Tuesday) at 11 p.m. to catch the replay. HBO and Showtime have agreed on how they would broadcast a fight between Floyd Mayweather Jr. and Manny Pacquiao, promoter Bob Arum said Thursday, leaving only two remaining issues to be settled before the much anticipated May 2 fight can be signed. Arum told The Associated Press that the rival networks have come to terms on an announcing team and other details for the pay-per-view blockbuster, and that talks this week have narrowed the remaining differences between the Mayweather and Pacquiao camps. Arum declined to say what those two issues are, saying he didn’t want to sabotage the negotiations just as they are reaching a critical juncture. And it was not clear whether the Mayweather side views the negotiations the same as Arum, or even if Mayweather will agree to the fight. Mayweather’s adviser is Al Haymon, who reportedly has been doing the negotiating on his fighter’s behalf. But Haymon doesn’t talk to the media, and Mayweather communicates almost exclusively through social media. Arum said the major financial points of the fight have been agreed to, including a reported 60-40 split in the purse in Mayweather’s favor. Based on the fight doing a record $200 million or more in revenue, Mayweather’s payday could be at least $120 million. Mayweather’s representatives have dictated most of the terms of the fight, and Arum said Mayweather will be the one to announce it if it is made. Mayweather fights under contract to Showtime and Pacquiao to HBO, and there was speculation the two networks could hold up the fight by not coming to terms themselves. But talks between top executives have been ongoing for weeks, and HBO issued a statement Monday saying it was not an “impediment” to the fight. An HBO spokesman declined comment Thursday, and Showtime executives were not immediately made available for comment. While Mayweather has been vacationing, Pacquiao was heading home Thursday to the Philippines after a trip to the U.S. and England. While in Miami for the pageant, Pacquiao attended a Miami Heat basketball game the same night Mayweather was there and the two fighters exchanged numbers and discussed the fight. They later met for an hour, and Arum said the meeting convinced him that Mayweather wanted to make the fight. Before heading home, Pacquiao also met in Washington with Senate Minority Leader Harry Reid and on Thursday attended the National Prayer Breakfast, where President Barack Obama spoke. Junior lightweight contender Diego Magdaleno re-signs with Top Rank Inc.
Diego Magdaleno/Photo courtesy of Top Rank Inc.
Diego Magdaleno, ranked as high as No. 3 in the world as a junior lightweight, has re-signed with promoter Top Rank Inc., it was announced Thursday morning by Top Rank. Magdaleno, 28, is a 5-foot-6 southpaw out of Las Vegas via Los Angeles. He’s 27-1 with 11 knockouts. Magdaleno most recently stopped Hevinson Herrera in the third round in November in Pharr, Texas.